Bit hard to whinge about the ‘dead of winter’ here in Perth but it is cold. 3 degrees as we speak. But we’ve a warm house and plenty of warm clothes so we’re much better off than many. This is my last list till September as we are off on a sojourn to Canada and the US to visit offspring and their offspring. Can’t wait! In the book world we are a rare species with the prevalence of computers, iPads and mobile phones. There are a few who hang in but every year we hear of another long-term book business going to the wall. If you don’t ‘own’ your premises it’s very difficult to sell enough books to cover the rent. And I feel for every one of them who you get to know personally. In the last year Serendipity Antiquarian Books closed their doors. It was a matter of retirement and a need to move onto something else. Damn shame as they always had an abundance of well-priced quality military books. 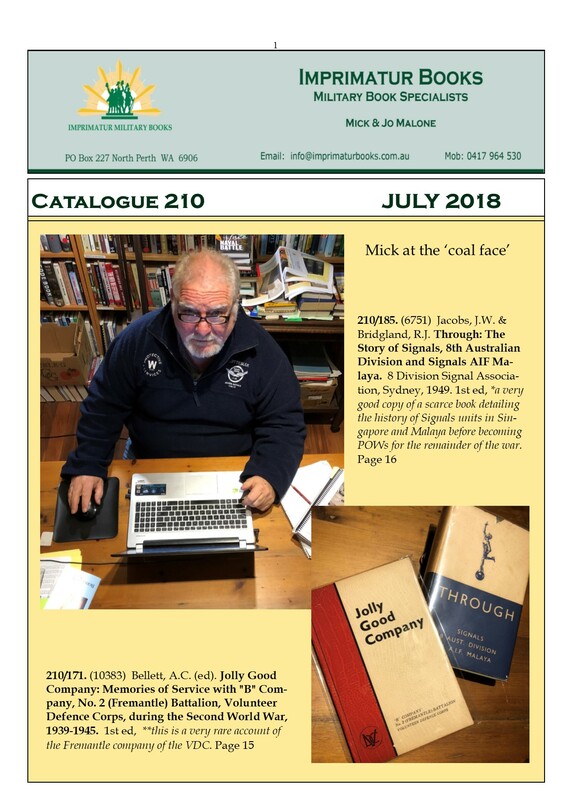 Speaking of quality books, this catalogue features some great books many of which are ‘first time listings’. It’s always good to find these gems and they fly out the door as soon as I list them. So get in early on this lot. As usual, we dedicate this list to those soldier who are still serving in harm’s way and those who have given their lives in the service of this country. And for those not travelling too well, we are here for you brothers.